If you think Cuba makes the best cigars, guess again. You don't have to know cigars to know — or think you know — that the world's finest are made in Cuba. As long as anyone can remember, the word "Havana" has been synonymous with quality cigars. 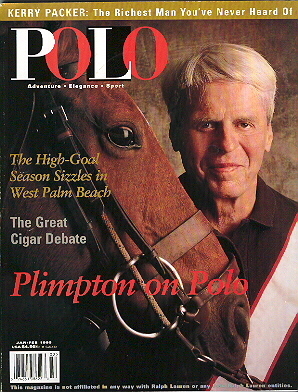 Ever since President John F. Kennedy announced the U.S. trade embargo against Cuba in early 1962 (which he effected only after his aide Pierre Salinger laid in a supply of more than 1,000 H. Upmann Petite Coronas for the president's own post-embargo enjoyment), Cuban cigars have maintained the allure of forbidden fruit. "We all know that the luxury, the enjoyment, the aesthetics, and the snobbishness of smoking tobacco," writes anthropologist Bronislaw Malinowski, spelling out the consensus view, "are associated with these three syllables: Havana." Fernando Ortiz, in his 1940 Cuban Counterpoint: Tobacco and Sugar (now out of print but still the best published history of Cuba's two primary agricultural products), notes that "Havana cigars, like champagne, are something unique that cannot be surpassed or substituted." Even the expatriate Cuban novelist and screenwriter Guillermo Cabrera Infante — renowned as both a lover of cigars and a critic of Cuba under Fidel Castro — has acknowledged his homeland's continuing cigar supremacy. "Almost 500 years after the Discovery, Havanas are the best cigars in the world by far," declares the author in Holy Smoke, his pun-happy 1985 history of tobacco and cigars. More recently, however, certain heretics have begun questioning this most basic tenet of the cigar smoker's faith. Joel Sherman, the president and chief executive officer of Manhattan's Fifth Avenue tobacco emporium Nat Sherman Inc., tops the list: "Though the mystique of the Cuban cigar powered the U.S. cigar industry as a whole for most of the 20th century, and many cigar enthusiasts still genuflect when they hear the name 'Cuba,'" writes Sherman in his 1996 primer Nat Sherman's A Passion for Cigars, "I maintain that the cigars coming out of Honduras, Mexico, and the Dominican Republic today are superior to the Cuban." The main problem with Cubans, critics say, is that they aren't aged sufficiently. "Cuban tobacco," Sherman notes, "is hardly aged at all, generally making the journey from farm to cigar box in seven months." The better cigars from the Dominican Republic, Honduras, and elsewhere in the Caribbean, he writes, "are aged anywhere from three to five years." The shorter aging periods for Cuban cigars stem from huge increases in production quotas demanded by Cuba's government in recent years: from 70 million cigars exported in 1996 to 103.5 million in 1997 to a projected 160 million in 1998. And Cuba's already optimistic target number for the year 2000 was raised recently from 200 million to 300 million. The better cigar makers in the Dominican Republic aim for slower and steadier production increases, usually of no more than 10 to 20 percent per year, to avoid jeopardizing their cigars' hard-earned reputations for quality. This consistently high quality from its established cigar makers has made the Dominican Republic the leading cigar exporter in the world, with its 250 million cigars exported in 1997 more than double the total of runner-up Honduras at 120 million. Roughly half of all premium cigars sold legally in the United States are manufactured in the Dominican Republic. Of course, importing Cuban cigars to the United States has been illegal since the 1962 trade embargo. Cuban cigars remain popular and respected wherever they remain legal, and there is said to be a booming black market in illegal Cubans and Cuban counterfeits in the United States — an estimated five to six million Cuban cigars are sneaking into the country each year. All of this begs the big question: Is it really possible that Dominican factories are producing better cigars than those coming out of Cuba? Last summer, Polo went looking for the answer, dispatching photographer Ernesto Bazan and me to the Dominican Republic and Cuba to see what we could determine. Our investigation begins in the Dominican Republic's Cibao Valley and its principal city, Santiago de los Treinte Caballeros. It is here that the best Dominican tobacco is grown and most (but not all) premium hand-rolled Dominican cigars are manufactured, among them such brands as Arturo Fuente, Aurora, Avo, Cohiba, Davidoff, Fonseca, Fuente Fuente OpusX, Juan Clemente, León Jimenes, Partagás, and Romeo y Julieta. 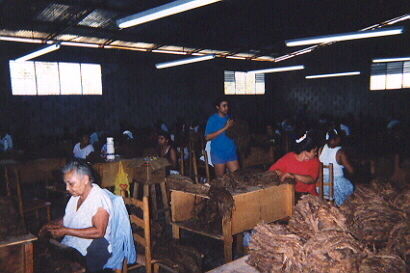 We watch workers sort and package dried leaves from the spring harvest at a pair of casas de tabaco (curing barns) outside Santiago and are walked through the rudiments of cigar making at three Santiago factories. The process works thus: Tobacco is planted in November, harvested in February and March, and spends the next three months drying itself brown in a curing barn located in or near the field in which it grew. From there, the leaves are shipped to a factory where they are cured and fermented for anywhere from several months to three years, deveined, and sorted into various leaf types and subtly differentiated shades of brown. Ideally, they are then set aside to age yet another one to three years. Cigar making becomes most obviously artistic at the rolling stage. The work takes place in factory galeras, or galleys, where torcedores, the highly trained cigar rollers, sit side by side at wooden workstations resembling school desks. In the Dominican Republic, the torcedores tend to work in two-person teams of one buncher and one roller. The buncher rolls a prescribed combination of the three types of filler leaves — ligero, seco, and volado — and then wraps the resultant tube in binder leaf to create a bonche. This pairing makes up the core of the cigar and provides most of its flavor. When 10 of these cigars-in-the-making have been assembled, they are put into a wooden mold and pressed in a vice clamp for 15 to 45 minutes. 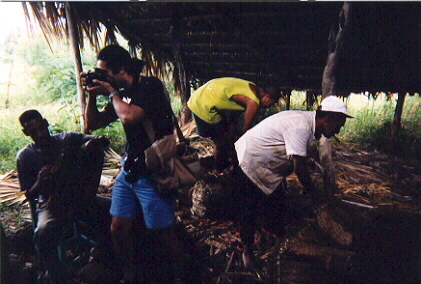 The rolling process goes on all day long, often with merengue or other lively music playing over loudspeakers. In some factories, there are daily readings by a lector, a person hired specifically to read newspapers, novels, horoscopes, and so forth to the rollers while they work. It is important to keep up the workers’ morale, we are told by La Aurora production coordinator Manuel Iona as he walks us through the factory he oversees. Indeed, the most noticeable thing about the La Aurora factory is how happy the workers appear to be. 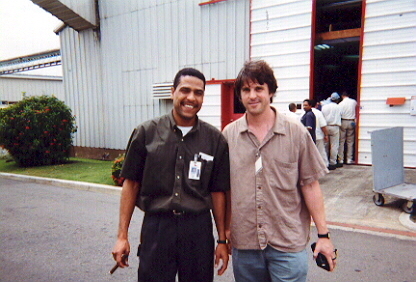 León is unusual among Dominican cigar makers in that he is a full-fledged Dominican. His grandfather began making cigars in Santiago in 1903, and his family now controls a sizable business empire that also manufactures such items as cigarettes, beer, soft drinks, and candies. León and his family are without question capitalists, but they are enlightened capitalists. Workers are provided excellent discounted meals at the company cafeteria, free transportation to and from work, health care and other benefits, and even have their birthdays celebrated at a company-run nightclub. Pay is not so great by North American standards — rollers earn somewhere between $450 and $600 a month, according to León, depending on how many cigars they make — but even that seems a windfall compared to what their Cuban counterparts receive: $16 a month or less. Something is definitely affecting the quality of Cuban cigars, according to León. He stands up and fetches a small foil-wrapped package of cigars from a private humidor behind his desk. “You have heard of Cohibas, right?” he asks. “This is the 30th anniversary of Cohibas in Cuba. I received this present.” He pauses, slowly peels back the tape that secures the foil, then unfolds the foil itself to reveal a half-dozen Cohibas resting side by side. He cups the opened package in his hands and holds it out to us for closer inspection. “You can try any one of them,” he tells us, weighing his words for dramatic effect. “If it draws, I’ll pay you. León said that he is unconcerned by the prospect of the United States eventually opening its trade doors to Cuba and its cigars. “I’m not afraid,” he said. “No way. You’ll see — they are not used to Cuban cigars. The people who are smoking Cuban cigars in the United States are people who like to show off. They offer it to you as a thing nobody can get. Once everybody can get it ...” He finished his thought with a shrug of his shoulders. Carlos Fuente Jr., better known as Carlito, is equally unconcerned by the possibility of Cuban cigars someday becoming available in the United States. Carlito and his sister, Cynthia Fuente Suarez, greeted us at Arturo Fuente, the older of the family’s four cigar factories in the Dominican Republic, which the siblings run with their father, Carlos Sr., and Cynthia’s husband, Wayne Suarez. Arturo Fuente cigars have been make in the Dominican Republic only since 1980. Carlito and Cynthia were raised in Tampa, Florida, where the family cigar company was founded by their Cuban grandfather n 1912. In the 1970s, the Fuentes manufactured cigars in Nicaragua, but the Sandinista revolution there cost them their factory. They relocated to Honduras, where, within a year of their arrival, a 1979 fire destroyed their factory and everything in it. The next year they opened the first of their Santiago factories. And that is merely the aging of the tobacco leaf. The cigars themselves are aged a minimum of six months more, after they have been rolled, in one of 15 special aging rooms that the company maintains for this process. Inside these aging rooms there is a strong smell of ammonia. It is partly because the Cubans routinely omit this final aging of the completed cigars that Cuban cigars often are perceived as harsh or strong by smokers more accustomed to Dominican cigars. “Dominican cigars are considered milder than the Cubans because companies like General Cigar and ourselves — we have great resources, capital, a long history in the cigar business — use a very fine aged tobacco,” Carlito explains. “You’ll get a very full-bodied tobacco, but through a long aging process, with patience and time, that tobacco becomes very smooth. When American consumers find a cigar that’s smooth — that’s not offensive and doesn’t fight the palate — they consider it to be mild. But it’s not necessarily mild tobacco. It could be very full-flavored tobacco, blended very complex. Díaz suggests that the recent problems being talked about concerning Cuban cigars have less to do with a diminishment in their quality than with deliberate propaganda campaigns aimed at discrediting them. Dominican competitors, he claims, were most likely to blame. Tobacco is grown elsewhere in Cuba, but only that grown in the Vuelta Abajo region of Pinar del Río is supposed to be used in true Havana cigars. Oddly enough, although Europeans first made their acquaintance with tobacco on the eastern end of Cuba in October 1492 — when two subordinates sent to the island reported back to Christopher Columbus the strange sight of natives smoking rolled-up leaves — Pinar del Río wasn’t discovered to be suitable for growing tobacco until sometime in the 18th century, when Cuban farmers migrated there to circumvent a Spanish tobacco monopoly. Cuba didn’t actually become the world’s leader in cigar making until the 19th century, when Spain decided that finished cigars survived the trip across the Atlantic better than unrolled tobacco leaves. Famous still-existing brands such as Partagás (1827), Punch (1840), H. Upmann (1844), and Romeo y Julieta (1850) began springing up soon afterward. 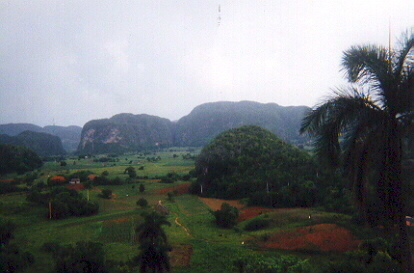 Pinar del Río is hilly, lush, and beautiful. Perhaps its best-known resident farmer, José Manuel Sisto, better known as El Ninó, has been growing tobacco here and smoking cigars (15 of them a day, he claims) for more than 50 years. 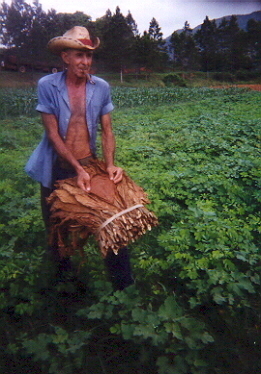 El Ninó’s grandmother told him their ancestors were among the first people to grow tobacco in the area. The day we pulled up at his farm, a bulldozer was cutting a new road to the place to make it more accessible for tour buses. A bar and T-shirt shop (some of the shirts featured El Ninó’s bare-bellied image) is located between El Ninó’s house and his curing shed. After a quick tour of the shed, we sat down with him over beers and discussed Cuban tobacco. 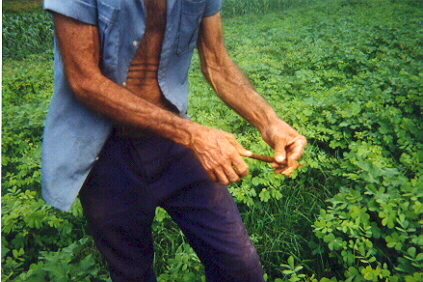 El Ninó, like all Cuban growers, is allowed to keep about 100 pounds of each year’s tobacco crop for his personal use, which means rolling cigars to smoke himself and to give or sell to visitors. 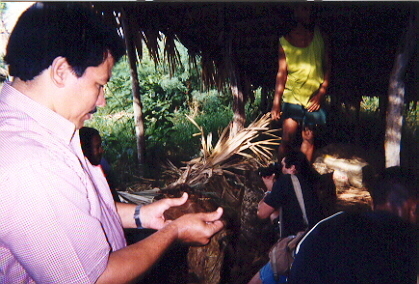 Otherwise, he says, he is paid 175 pesos, or about $8, per 100 pounds of tobacco grown. The next farmer we visited, Pedro Emilio Pérez Vega, told us that the government pays him 153 pesos per 100 pounds for the 3,000 pounds he grows annually, which the government had told him is its top rate. Other farmers, El Ninó had already told us, are paid as little as 80 pesos per 100 pounds for what is deemed inferior tobacco. So what does it all add up to? Are Cuban cigars still the best, or are they riding on a reputation that is no longer deserved?